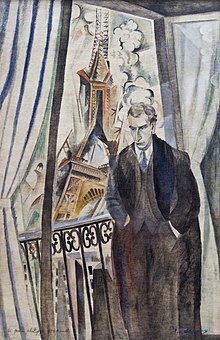 Portrait of Philippe Soupault by Robert Delaunay. Philippe Soupault (2 August 1897, Chaville, Hauts-de-Seine – 12 March 1990, Paris) was a French writer and poet, novelist, critic, and political activist. He was active in Dadaism and later founded the Surrealist movement with André Breton. Soupault initiated the periodical Littérature together with the writers Breton and Louis Aragon in Paris in 1919, which, for many, marks the beginnings of Surrealism. The first book of automatic writing, Les Champs magnétiques (1920), was co-authored by Soupault and Breton. In 1927 Soupault, with the help of his then wife Marie-Louise, translated William Blake's Songs of Innocence and Experience into French. The next year, Soupault authored a monograph on Blake, arguing the poet was a "genius" whose work anticipated the Surrealist movement in literature. In 1933 at a reception at the Russian Embassy in Paris, he met Ré Richter and they decided to do some travel reportage together. Ré Richter’s photographs, taken with her 6x6 Rolleiflex, were to be published alongside Philippe Souault’s literary texts. In the years thereafter, the two of them continued in the same vein, travelling to Germany, Switzerland, England, Scandinavia and Tunisia. They married in 1937. The couple separated after the end of the war; he moved back to Europe and she remained in New York. He directed Radio Tunis from 1937 to 1940, when he was arrested by the pro-Vichy regime. He fled successfully to Algiers. After imprisonment by the Nazis during World War II, Soupault traveled to the United States, teaching at Swarthmore College but returned subsequently to France in October 1945. His works include such large volumes of poetry as Aquarium (1917) and Rose des vents [compass card] (1920) and the novel Les Dernières Nuits de Paris (1928; tr. Last Nights of Paris, 1929). In 1957 he wrote the libretto for Germaine Tailleferre's opera La Petite Sirène, based on Hans Christian Andersen's tale "The Little Mermaid". The work was broadcast by French Radio National in 1959. In 1990, the year Soupault died, Serbian rock band Bjesovi recorded their version of his poem Georgia in Serbian. Soupault's short story "Death of Nick Carter" was translated by Robin Walz in 2007, and published in issue 24 of the McSweeney's Quarterly. In 2016, City Lights Bookstore published a book of his essays entitled Lost Profiles : Memoirs of Cubism, Dada, and Surrealism as translated by Alan Bernheimer. Les Dernières Nuits de Paris (1928, novel). This page is based on the Wikipedia article Philippe Soupault; it is used under the Creative Commons Attribution-ShareAlike 3.0 Unported License (CC-BY-SA). You may redistribute it, verbatim or modified, providing that you comply with the terms of the CC-BY-SA.